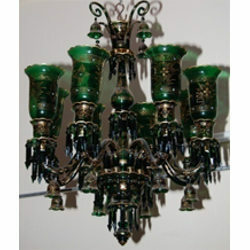 Hand crafted wrought iron 4 light chandelier with bulb holders. Each chandelier is hand crafted using the finest materials. We offer a wide range on Lamps like Table, Floor and ceiling. 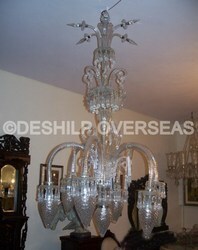 The same design is in Iron with crystal decorated and silver plated finish. While climbing on the success ladder, it has become increasingly important for us to deliver a wide range of Handicraft Jhumar. To enhance the beauty of entrance of your home, offered jhumar is perfectly designed by our nimble professionals by making use of quality assured material in compliance with the set industry standards.